Cucumber pickles, homemade ones (! ), are one of the most heavenly of ferments. They were also one of the first I ever made and I truly couldn’t believe the difference to shop bought pickles, preserved in vinegar. This summer, a Fermented Foody follower wrote to me on my Facebook page and asked a few questions about making them. All the information is here. Our conversation focused on leaves. You’ll need to consult with a local expert if you need to choose leaves with which you’re not familiar. If you’d like to check the internet first, this website, run by Green Deane, seems to be a pretty informed place to start. He’s been foraging for over 60 years, so he’s well placed to give advice! 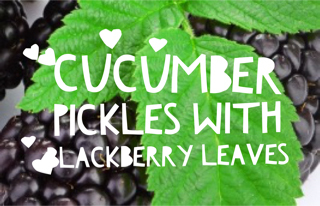 It’s still blackberry season here in the UK; the best time to harvest leaves and make a few batches of pickles. If you look after your ferments, those leaves can be moved from one ferment to another and should see you through to the next season. I’ve managed it myself, after developing a passion for these pickles; this being the most available local leaf. grow wild near our house, along stretches of the River Thames, as well as roadside .. in many unexpected places. Keep a basket in the car (plus a bin bag to sit beneath it for protection and a pair of gardening gloves and pliers, to protect your hands and move spiky branches) and a feast of fresh berries could be yours before you know it. Blackberries could be growing wild near your house, along stretches of a local river, as well as roadside, in many unexpected places. Why not keep a large plastic tub and lid in the car (plus a pair of gardening gloves and pliers to protect your hands when you move spiky branches) and a feast of fresh berries could be yours before you know it! Here’s the recipe link again ..
I’ve not tried this without using a vegetable culture starter. It’s the only vegetable ferment for which I use a starter. This version remains lovely and crunchy throughout their entire time in the fridge, so I’ve not minded spending on powders to achieve such a perfect result. I hope you’ll soon feel the same.